The Physician, or Doctor, trained at University for 7 years, and even before taking his medical degree, was expected to have a good grounding in the arts; he would have been both technician and philosopher. He was the choice of the rich. He had to be paid, and paid well. Snobbery of the day meant the more you paid - even having your pills covered in gold leaf - the better the treatment you believed you were getting! Throughout this period most illnesses were blamed on an imbalance of the four "humours", wet, dry, hot and cold. Of course illness was also thought to be divine retribution for wrong doing. Methods of diagnosis included inspection of the patients urine - he or she need not even be present for this, a servant may deliver a specimen in a "jordan" - the look, the smell, and even the taste of it, supposedly giving clues as to the patients' problem. A horoscope may also be drawn up. The "heavenly bodies" influencing different parts of the body e.g. Aries, the head; Taurus, the throat, etc. Whatever the diagnoses, purging the patient in one form or another was generally prescribed. 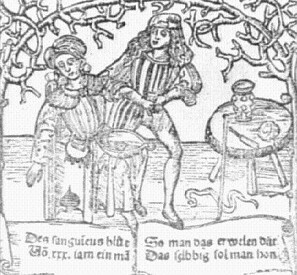 Bloodletting being a popular form, with "cupping" or leeches used for the elderly, the young or very sick. A Physician would have your medicine prepared for you by the Apothecary. The Apothecary prepared and supplied medicines - a forerunner to our modern pharmacist. He, or she (women could work everywhere except London as apothecaries), would serve an apprenticeship and belong to a guild. 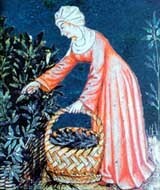 By Medieval times there was a wide range of exotic spices, gums and resins being brought in from the East. Although some were bought by the wealthy for their culinary uses, most went into medicines. 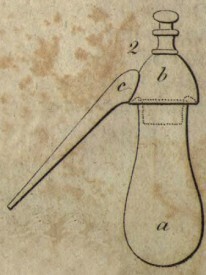 The Apothecary also had the means to filter, distil, powder and blend ingredients for medicinal use. Apart from the belief that an imbalance of the humours made you ill, it was also believed that "bad smells" were bad for your health too. Having no knowledge of germs, viruses, or bacteria the logic of this wasn't as daft as it sounds. No flushing loos; no "binmen" to take away rubbish, particularly from tradesmen such as butchers; no tarmac roads or proper pavements, animals - and all they leave behind! - going through town to market, all added to the "bad smells". Although the smell didn't make you ill, the waste matter did bring in the rats, who were the carriers of many diseases. To combat the "bad smells", the wealthy would buy Pomander Beads from the Apothecary, to carry and hold up to their noses when walking through town. A great deal of the medical knowledge the barber/surgeon had came from autopsies and embalming. During a war the barber/surgeon would tend the wounds inflicted on the battlefield. 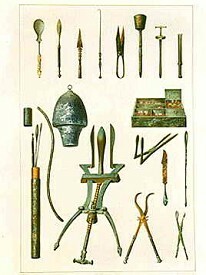 Performing amputations and other duties including searching wounds with irons and other instruments, staunching blood flow, sewing flesh, setting bones, and even cutting the skull with iron tools. In peacetime he would earn a living cutting hair and doing dentistry, possibly moving from town to town. He would still perform blood letting, lancing boils and burning out canker. Although on the battlefield surgical procedures would have been carried out with the patient conscious, and without anaesthetic or pain relief, in peacetime help was given to those about to be treated. Seed of white henbane (a very poisonous plant) in wine; or a sleeping ointment used on the temples, armpits, hands and feet made from the juice of henbane, mandrake, hemlock (all poisonous), lettuce, poppy, with all their seeds crushed, and put into swine grease and boiled! You hoped he'd listened to his teacher very carefully! Monasteries of the time were landowners, and the monks were educated men. With knowledge, money and land the monks built hospitals to tend the sick and elderly, and had physic gardens to grow herbs for medicinal use. Alan Titchmarsh was not the first gardener to have raised beds, or Monty Don the first to garden 'organically' and with 'companion planting'! The monks had a series of beds within the physic garden, each enclosed and raised. Research is still being done as to whether individual beds were for groups of plants enjoying the same conditions, well-drained dry soil etc, or whether they might have been planted up with herbs that treated certain conditions all together. What is known is that other flowers were planted in between to attract the 'good' insects into the garden to dispose of, or deter, the 'bad' insects, companion planting. Chives planted with the carrots confuse the carrot fly by disguising the smell. Also flowers were grown to attract the bees, for their honey and as excellent pollinators. Many monasteries had wealthy patrons, men who during the Medieval period fought in the Crusades, who brought back plants from other countries for the monks to grow and to experiment with the possible medicinal properties. So monks were the researchers of their day. The monks were among the first to write 'herbals' and much of their knowledge was lost during Henry VIII reign and the Dissolution of the Monasteries. 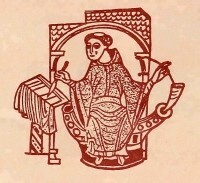 Medieval monk - possibly writing a herbal? The majority of the people in Britain at the time were poor and lived in a rural setting working on the land. The first port of call for them if unwell was the lady of the house and her medicine cabinet in the garden. Every cottage would have had a piece of land and this garden would have been planted up with food crops, medicinal herbs, strewing herbs and dyeing plants. Many plants served several of these functions. For more serious illnesses there was generally a herbwife in the village. Possibly living on the edge of the village, thereby having a little more land to grow medicinal herbs and to be able to collect many from the wild. She would have learned from her mother, a vast knowledge being past down from generation to generation. Her 'payment' would have been more likely to be eggs from your hens, a piece of pork, or even some fabric; something useful for her and affordable for you. Every girl would have been taught by her mother how to tend the garden, prepare the beds, when to sow the seeds, the care of the plants and when to harvest them. As many herbs don't grow during the winter months they would have been gathered and dried so there was a year round supply of sage for sore throats etc. Pomander Beads were made by the Apothecary for people to carry with them, particularly in towns. In Medieval and Tudor times people believed it was the "bad smells" that made them ill (and there were plenty of bad smells about!) so they carried "good smells" to protect them. Pomander Beads were made from a mixture of sweet smelling herbs and spices, and made into a hard ball with a gum. If you can follow a recipe and cook a meal then this 'recipe' is easy to follow (see my guestbook and the 9yr old who made them for her class presentation!). As used in a School for gifted children in Texas USA! for KS1 it comes with plant folklore.